Remington R1 1911, .45 ACP. Mark Campbell — Mid America Arms, St. Louis, Mo. Like many other gun shops, Mid America Arms is seeing a surge in demand for smaller, concealable handguns. But, notes owner Mark Campbell, he’s still moving a good number of full-sized 1911 model semi-automatics. Currently, his top selling 1911 is the Remington R1 in .45 ACP. Models range from $700 to $1,100, with most sales coming in at the $750 to $800 mark. Customers increasingly want laser sights on their handguns, and many are opting for handgun-and-laser packages right from the manufacturer, with models from Ruger, Smith & Wesson and Kimber leading the pack. Local snow goose hunters are purchasing decent numbers of Benelli Super Black Eagles and M2 shotguns. Benelli’s newest shotgun, the Ethos, has yet to arrive at his shop at the time Campbell was interviewed, but he had already has a number of orders for this $1,800 scattergun, sight unseen. 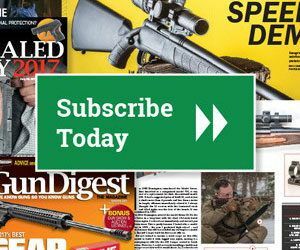 Editor’s note: This brief originally appeared in the March 27, 2014 edition of Gun Digest the Magazine. In 1911: The First 100 Years, take a journey back through a century’s development and history of John M. Browning’s timeless pistol design, the .45-caliber M1911. Even if you have just a passing interest in the 1911, this fully-illustrated full color hardcover book belongs in your library. But if you’re a real diehard fan of the 1911, this classy, well-researched book will be the centerpiece of your references. You’ll learn about everything from the origins and earliest designs of the handgun to today’s hottest tactical 1911s for concealed carry and competition.